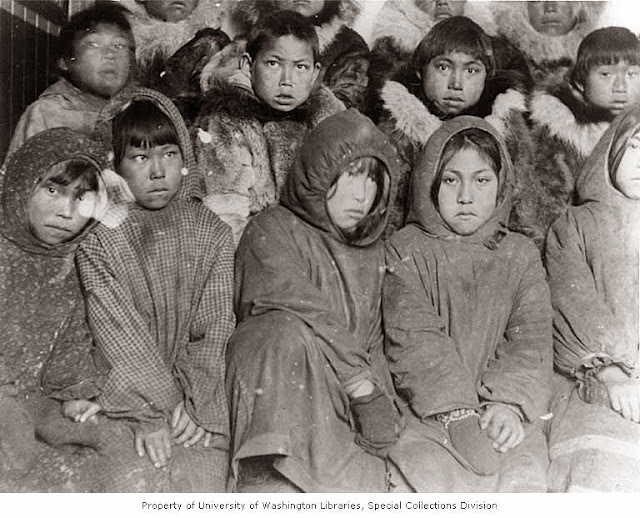 The Alaska Native Studies Blog: Asserting a Racial Geography in Northern Alaska, 1901-1906: "The ability to imitate with masked fidelity." Asserting a Racial Geography in Northern Alaska, 1901-1906: "The ability to imitate with masked fidelity." In October 1901, Susan R. Bernardi went to Kingegan, a village located in Cape Prince of Wales, Alaska, to work as an instructor at a religiously-based government-funded school. Kingegan's closest major town is Nome, a former-village where the population more than tripled from 1890-1900 because of the gold rush. After holding similar positions in the southern United States, her job involved teaching the Natives of Kingegan a general curriculum. As the most western inhabited place in the Americas the village surely proved most distinct from any of her previous experiences. 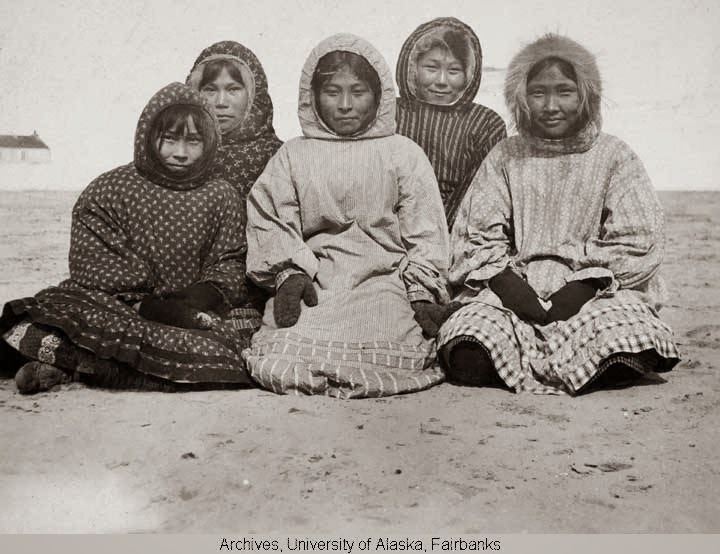 Writings and photographs from her personal collection helps understand the way in which people from the United States would came to think about Alaska and Arctic people more broadly. With an album containing 105 photographs held at the University of Washington special collections one can peruse captivating images taken during her time there. 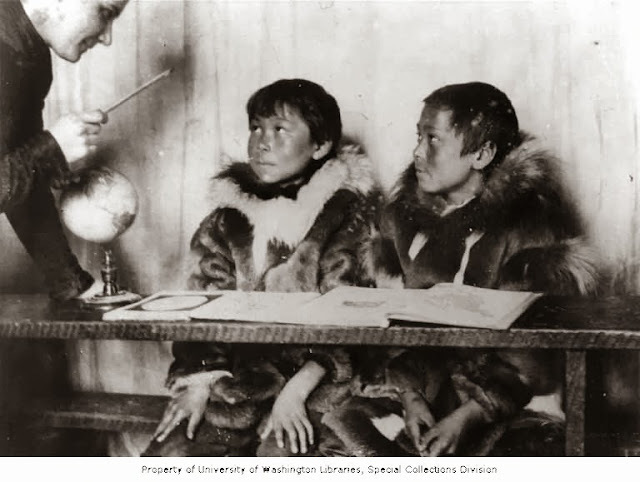 For instance the photograph below depicts Bernardi in a classroom of Inupiat students, seated at desks, reading their text books. She peers intently at the students, with the United States flag hanging above her head. Take notice of the globe next to her. On the chalkboard one can make out a date "May Tenth" and some basic arithmetic. In the written passages of the collection Bernardi refers to the Inupiat villagers as "Eskimo," a term, to say the least, that makes for a host of complications in it's usage and proves entailed with countless derogatory meanings and unintended significations. Bernardi was not alone in employing the term to describe the vast cultures of people who inhabit a large portion of the Northern world. In fact, the written parts of the album along with the images provide for the reader and viewer an archive on how Westerners thought of Arctic people as they set upon their communities with various agendas. 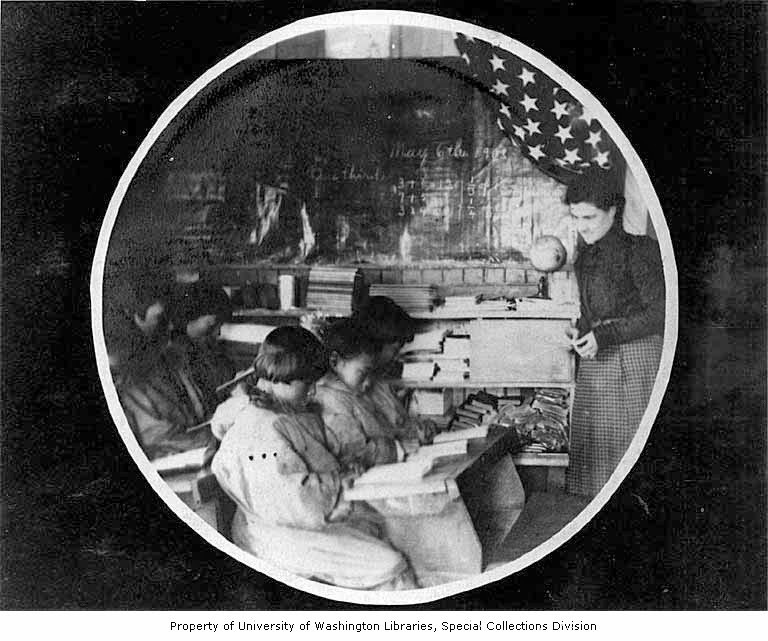 "Susan R. Bernardi teaching Eskimo pupils at U.S. Government School, Cape Prince of Wales, Alaska, ca. 1906"
The image above belongs to a genre of photographic work, that when taken, attempted to depict how indigenous students could be taught a curriculum of knowledge and basic skills that would shape them into competent modern individuals, however unequal to their Western benefactors. Today we can see how these photographs document a rather unsettling history of colonial education that was taking place throughout the continent at the time. For the people of the Kingegan village lived competently long before the arrival of the school. There are many great works documenting the experiences indigenous children, and their families, endured at Indian boarding schools throughout the United States and Canada. The Bernardi collection proves compelling because it documents how a newcomer, one who was to bestow civilization upon the locals, came to situate this region's people within her beliefs about the broader world. "A lesson in geography. To Quont'nuk and Menadéluk"
The photograph above "A lesson in geography" spells out an unfortunately familiar and still quite moving scene where the instructor appears to be lightly scolding her wards, Quont'nuk and Menadéluk. What is to be made of this disciplinary scene, staged for a camera, in the midst of a geography lesson? Is the message here that the instructor will work tirelessly to teach the students where they sit in the global order of civilization? From my own memories growing up in Kodiak, I can clearly parcel out the moments in social studies class when, as a young person, I was being taught to fill out a map of the contiguous part of the nation. In all my teachers' efforts, their lessons to educate me on the locations of many Lower-48 states proved a hapless endeavor. What did this geography lesson mean for the instructor and how did it translate to the students and their families at Kingegan? Below is a photograph of more students, I believe in the bottom row are "Kuzrina, Natongok, Anouruk, Keotkona." Along with photographs of life among the Native residents Bernardi lent her hand to locating the people of the village in relation to the indigenous people of the contiguous part of the nation, as well as to the people of the Japanese nation. Please note Japan is approximately 2,500 miles away from Kingegan (the distance between Barcelona and Moscow proves closer than these two places are). "Eskimos are not Indians," she clarified for the viewers of the collection, "but Mongoloids." Not part of the Bernardi collection, below is an uncanny map of the western racial imaginary that constructed the "mongoloid" as a type. Since people of the village failed to embody comparable traits with "Indians," they somehow had to fit into the larger racial imaginary. 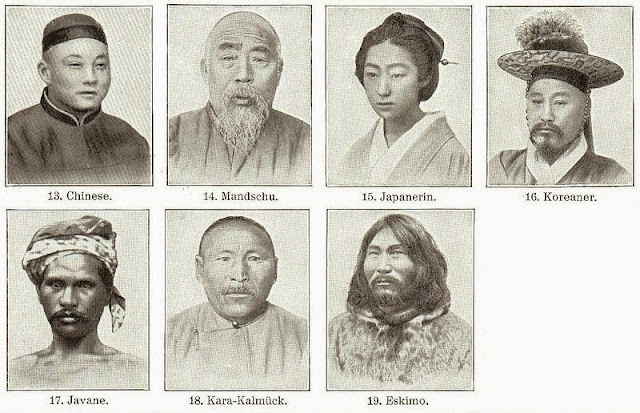 For as the passage ensued she wrote of the villagers' traits in relation to the Japanese, saying that "both have all inherent reverence for their ancestors, the Japanese possessing the characteristic a degree stronger than the Eskimos." The blanketing statement about both groups comes to illustrate the idea that there was a global hierarchy of civilizations (European at the top, indigenous at that bottom) that many people of the time invested their energies in proving as true and maintaining it as a truth for their benefit. In the ranking of civilizations the villagers, for Bernardi, sat beneath the way she imagined the Japanese. As noted by Coleen Lye in America's Asia, around the turn of the century the United States, eager to hold on to Pacific Rim colonies, began viewing Japan with suspicion (17-24). Perhaps because of these growing notions about the Japanese in the United States she felt it important to mark them as similar but distinct, even though they really aren't sharing a close proximity. Handwritten in album: "Telling whale stories." In comparing her upbringing to the villagers she wrote, "We are prone to say "bread is the staff of life." "The Eskimo," she argued, "would change it to "oil is the staff of life." She viewed the that for the villagers were dependent on oil, a claim which later could be applied to others in the region when the Trans-Alaska pipeline was constructed in Alaska. "the oil of the hair seal the walrus and whale provides for most of the wants of the Eskimo. He uses it to warm his house and dry his boots, to cook his seal meat and if there is no meat to cook he can use the oil for food. In olden times cariboo were plentiful. The meat was dried and the skins used for bedding and clothes. Heated deer suet rendered is eaten with snow and blue-berries it looks like whipped cream and is called koni mi nook. "When a person dies a feast is prepared and all friends and relatives come to the home and eat so that the dead one may not be hungry. If two persons fall ill at the same time in the same house one of them must be immediately moved, for should one die his spirit would call to the spirit of the other and he would have to go." Again, one can see how the description of the villagers moves from foodways to interpersonal relations. Further in the description she wrote that the villagers "never cheat each other but think it a virtue to cheat a white man." This horrid generalization meant that Native people act unethically towards outsiders, justifying the need to educate the children so they'll act morally and respect non-Inupiat people in all dealings. The problem I have with this statement is that she's talking about the parents whom are trusting her with their children in her classroom. The collection presents many photographs of young people, adorned in "western" (her words) clothes, posing for the camera. For almost a century the people of this region lived through multiple forms of abuse as they were made to attend these schools. A quick google search will give a list of accounts on the topic. There is also plenty of scholarship out there that asks readers to consider the viewpoints and histories of people whom these types of photographs were taken of as to better understand the agency and resolve they acted with in such harrowing times. In the conclusion of the passage she wrote, "Good bye in Eskimo means "I am sorry to see you go." 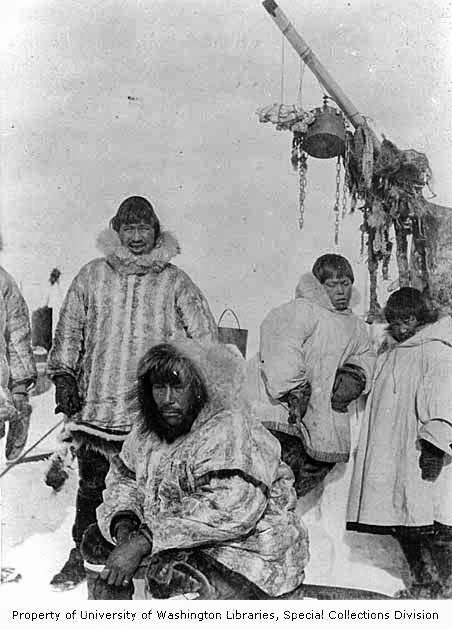 If you are calling at an Eskimo home you should not leave," she continued, "until your hostess tells you you may go." In the last sentence of her description she attests that, "if a man and his wife go to another village to trade and stay a few days it is a courtesy for the men to trade wives." Ending the passage with such an observation positions her work as justified in that she was bringing what she saw as a moral order to the people. 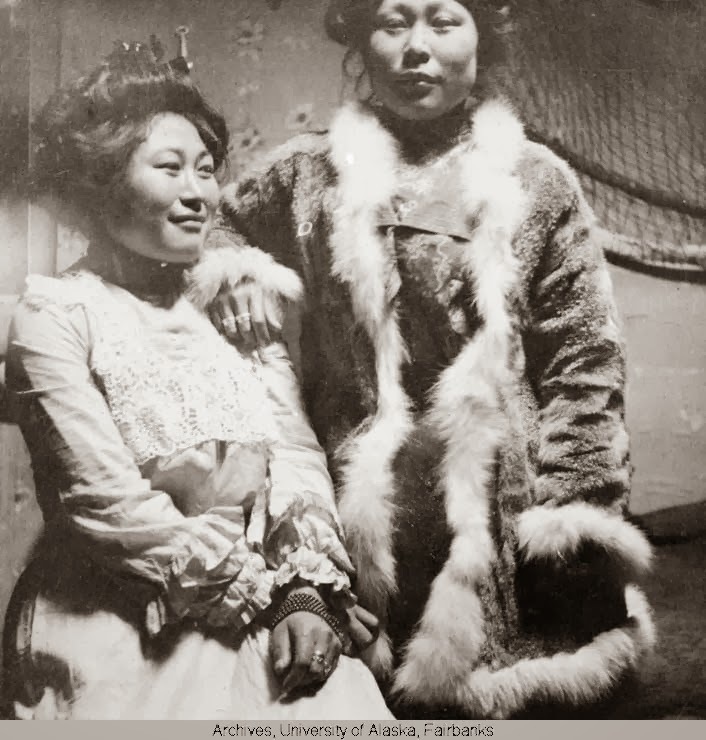 The album's photographs and narrations are a great archival source for the articulation of Western racial beliefs about subject peoples in a northern part of the Alaska Territory amid the early twentieth century.